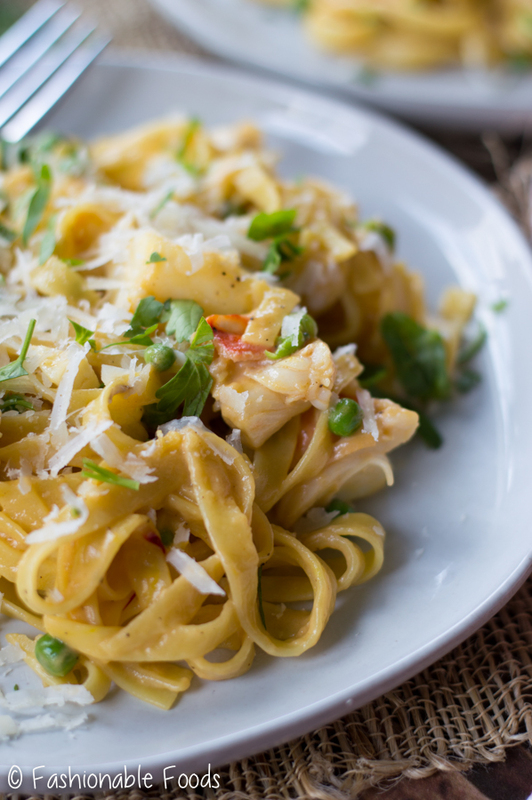 Tagliatelle with Lobster and Saffron Cream Sauce is the perfect special holiday meal. 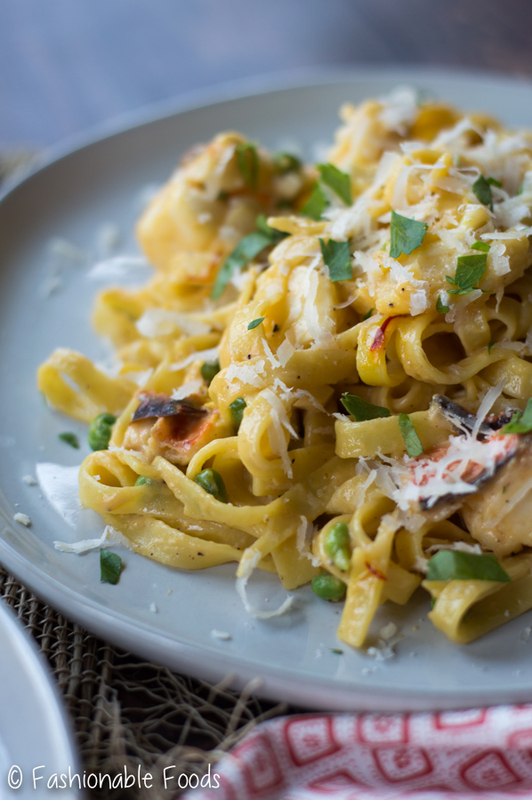 Full of sweet lobster meat, floral saffron, creamy mascarpone, and a pop of color from peas, this tasty pasta dish is sure to impress! Whenever the holiday season rolls around and I need an extra-special dinner, lobster is always my go-to. 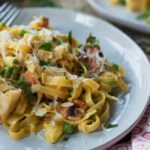 Christmas Eve and New Year’s Eve are popular times to serve up lobster and this year I’ve got you covered with a delicious pasta that will most definitely impress your guests! One of the most popular recipes on this blog is my perfect lobster tails, especially this time of year. 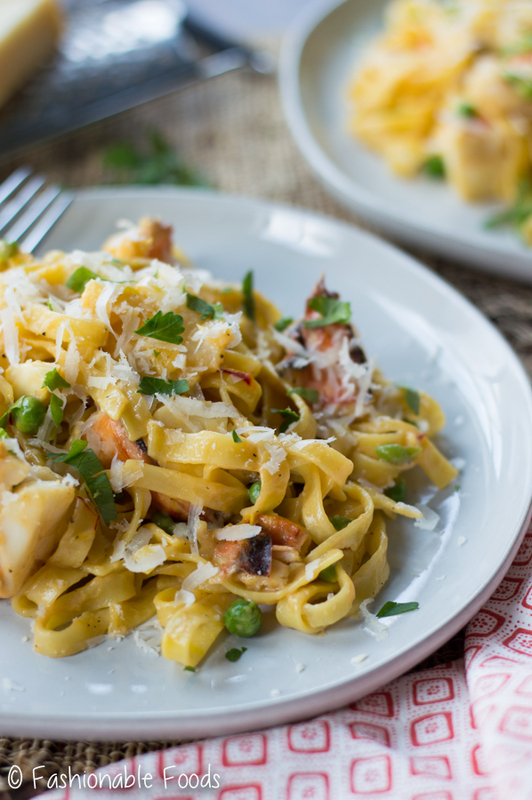 Simplicity is always a good thing when it comes to holiday meals, but if you’re looking to do something a little extra this year, you have to try this tagliatelle with lobster and saffron cream sauce. 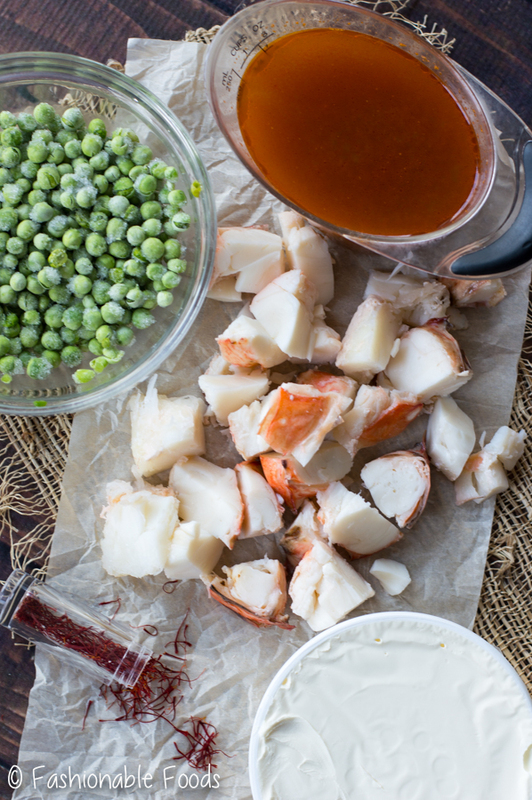 The recipe itself is simple – you just need a little extra prep time since we’re making a lobster stock to infuse the pasta sauce. Trust me, that lobster stock is what takes the saffron cream sauce to the next level. 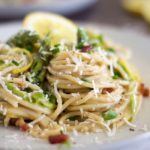 With a handful of quality ingredients you can make one of the most luxurious pasta dishes you’ll ever taste. After all, it is the holiday season so a little splurge is always worth it! 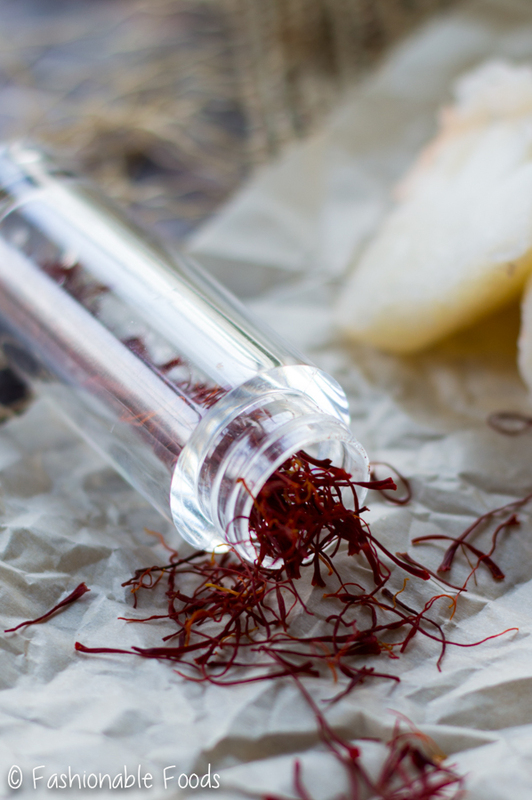 If you’re wondering where to buy saffron, a lot of grocery stores actually carry it in small quantities. Sometimes you have to ask for it, though because it’s often kept safely locked away in customer service! Or, you can order from Amazon – I like this one and find the price, quality, and small quantity to be perfect! Side note: I always recommend buying small amounts of saffron because a little goes a long way. If you buy a large amount you’ll be spend a lot of money for something that will ultimately lose potency before you can use it all. The most time consuming part of this recipe is making the lobster stock. 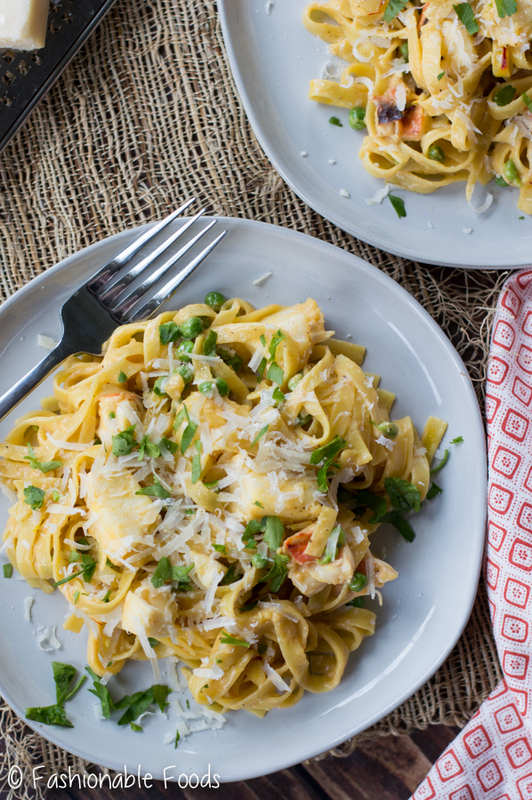 However, it’s what makes this pasta dish so darn good. You’ll start by steaming your lobster, letting the tails cool, and removing the meat from the shells. Then, sauté the aromatics, add the lobster shells, and simmer them with the reserved steaming liquid. What you’ll end up with is a rich flavored broth to infuse your saffron cream sauce! The great thing about making the lobster stock is that you can do it up to a day ahead! And once you have that made, the rest of the dish is easy peasy. 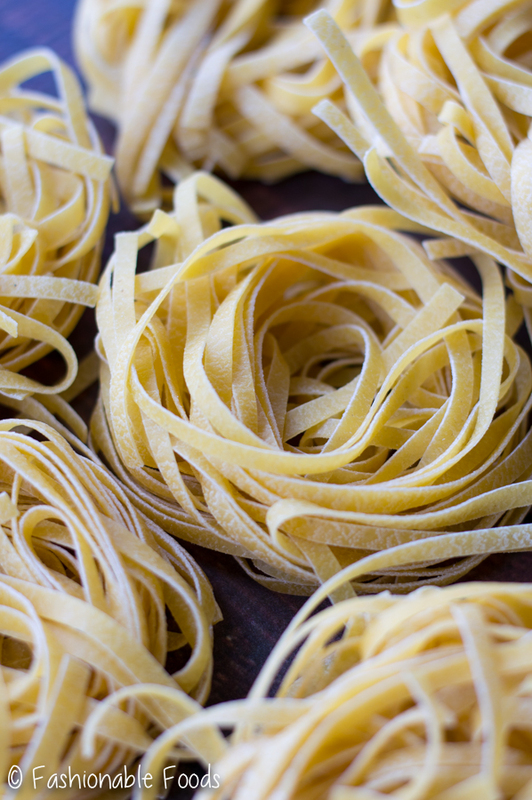 Boil up some pasta – I use tagliatelle nests because they resemble fresh pasta once they are cooked. 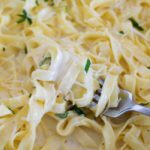 However, if you can’t find those you can use fettuccine (basically the same width pasta, just a tad thicker) or pappardelle is tasty, too! 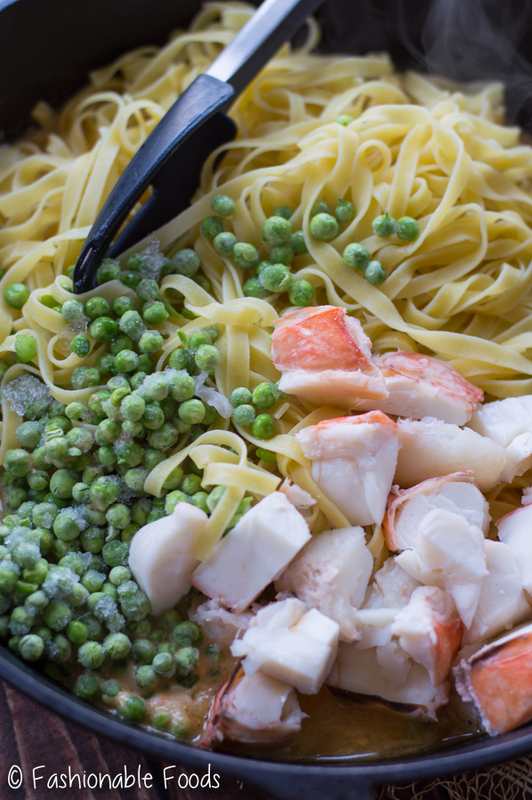 For the sauce, we melt the mascarpone into the lobster stock, add saffron, and then once it’s heated through just add your pasta, peas, and lobster. Toss it all together adding extra stock (or pasta water) to get the perfect consistency and you’re ready to eat! I recommend topping with fresh herbs (parsley or chives) and lots of parmigiano-reggiano. Normally I’m a huge no-cheese-with-seafood gal, but parm is the exception for me when it comes to shellfish. In my opinion, the nutty, salty flavor doesn’t overpower the seafood or add an off-taste. I find it to compliment the dish perfectly! Also, a crisp glass of white wine and lots of crusty bread alongside certainly wouldn’t be a bad thing. ? Put an inch of water in a large steaming pot and bring to a simmer. Using kitchen shears cut the top of each lobster shell down the middle. Place the lobster tails in the steamer basket and cover with the lid. Steam the lobsters until the shells are bright red and they begin to curl slightly, about 10-15 minutes. Save the steaming liquid! Remove the tails to a cutting board and let cool until you can handle them. Remove the meat from the shells (save the shells) and cut it into large cubes. Refrigerate while you prepare the rest of the dish. In a small pot, heat the olive oil over medium heat and add the shallot, garlic, and red pepper flakes. Sauté the aromatics until very fragrant, about 1 minute. Stir in the tomato paste and season well salt and pepper. Add in the lobster shells and pour in the reserved steaming liquid. You want the lobster shells to be almost covered, so add additional water if needed. Simmer the lobster stock for 45 minutes and then strain. Taste for seasoning and add salt and pepper if necessary. Bring a large pot of salted water to a boil and then add in the pasta. Cook according to the package directions. Drain, reserving pasta water. While you’re waiting for your water to boil, add 1 cup of the lobster stock and the mascarpone cheese to a large skillet. Heat over medium-low heat until the mascarpone melts and the sauce just begins to simmer. Stir in the saffron. Add in your drained pasta, peas, and reserved lobster meat. Toss well until everything is heated through. If the sauce is too thick, add any remaining lobster stock (or pasta water if you don’t have stock left) until perfectly saucy. 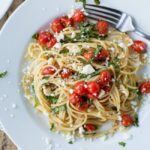 Serve the pasta topped with parsley or chives and lots of fresh parmesan cheese. I love this. Thank you so much for sharing!